There are very few treks that actually conform to a first timer’s ideas of what a trek would be like. I still remember my fantasies of happily walking on the mountains taking in the sights when I set out on my first trek to Tapovan/Nandanvan. The reality, however, was one of having to keep a careful watch on where one put his foot down lest he unintentionally took up tobogganing instead of trekking. Huffing and puffing while pushing wobbly legs up inclines was certainly not what I had conceived of when I took up trekking. Actually enjoying this process is something I’d have considered the heights of masochism before I actually found myself doing so. As a cousin of mine put it I nowadays undergo misery in order to enjoy myself (It comes out better in Tamil – Kashtapattu enjoy panran. Since kashtapattu would mean either putting in effort or being miserable you could read it as ‘He is working at enjoying himself’ or ‘He makes himself miserable in order to enjoy himself’). A new twist on the ‘Work Hard, Play Hard’ business! The trek to Kalhatti Falls and Kemmangundi, strangely enough, was the first time where I did trek on a smooth enough path for a long enough period to actually enjoy the view while trekking. Masochism has not taken such a strong hold over me that I can only enjoy myself when my lungs are contemplating the idea of giving up on me. As usual, I am getting ahead of my tale. The overnight drive to Chikmagalur – about 270 Kms – is not too tiresome since the roads are decent. We reached the spot from where we were to start the trek by around 5 AM and snoozed in the vehicle till 6 AM before we set off on the trek. 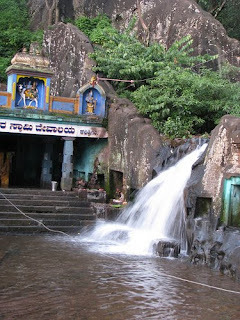 The falls at the bottom with a temple by its side is popularly known as the Kalhatti falls though the real falls were at a much higher altitude. This is where we were to end up on day one of the trek. 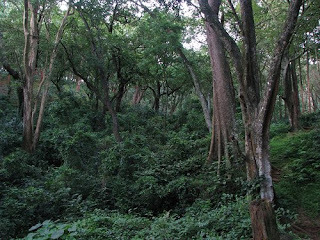 Within seconds of starting the trek we were ascending through a cathedral of tall trees. The path was challenging without being enervating and one could soak in the peace of the forest without being disturbed by your own distressed breathing. After about an hour’s walk we stopped for ‘freshening up’ and breakfast by the side of a mini-waterfall. I was into the water almost immediately. In Vinod’s absence, I was the only one in the water. The others were saving their bodily dirt for the main waterfall at the top. Looks like only Vinod and I believe that more than one bath a day is not injurious to health! I have never been particularly fond of bread and jam for breakfast but, after the morning’s trek and a dip in the waterfall, it tasted like ambrosia. 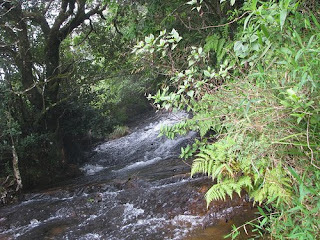 Breakfast was spiced with a distant view of the waterfall to which we were heading and a very enticing sight it was! We were on our way on that dream trail that I talked of at the beginning and the view around was well worth gawking at while walking the trail. Rolling mist on verdant plains enchanted us on one side while the tall graceful trees looked down benignly on us from the other. Such pleasant hikes don’t last on treks. According to the tour organizer – Kamesh – it wouldn’t have lasted long on this trek either but for his picking an easy trail to ensure that the grandfather and his two grandchildren, who were along on the trek, do not find it too difficult to do. Not that the grandfather would have felt that the chosen trail was easy when we next had to slip and slither up a steep slope to reach the waterfall. One almost forgot the leeches. 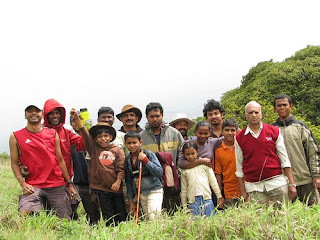 Nature is not always beautiful by the standards of men and on previous treks to Brahmagiri and Thadiyandamol, colonies of leeches had climbed all over the trek group. Thus, this desultory tasting of blood by one or two leeches was almost too insignificant to mention. One of the kids, however, could not get over the copious bleeding set off by leech-bites and her crying coupled with the shivering in the cold climes produced such musical effects that one involuntarily laughed at it though the child’s distress was all too real. Lest I give the impression that Supriya was a cry-baby I should mention that she did all that dangerous scrambling up slippery slopes with little complaint and her first attempt at rappelling later was done without a hitch. The waterfall delivered all that it promised. It looked even more wonderful than it had from afar. 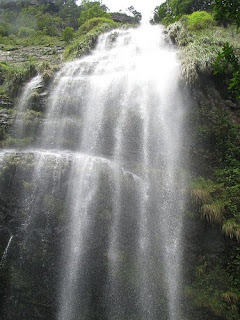 This was one of those falls which did not cascade in sheets of water but fell down like a shower from top. This, of course, meant that staying under the fall for any length of time was impossible except if you belonged to the blood of the mythical Hindu fakirs who slept on beds of nails. The water appeared intent on drilling through your ears and scalp and I, having an unprotected scalp, had to make do with staying immersed in the pool and looking up at the waterfall. The process of moving over to the site where the trek organizers were cooking lunch involved climbing up a slippery rock. My penchant for slipping, kept in abeyance this far, kicked in and Crack! Never before had I landed on my forehead on a rock. The sound was audible for about twenty feet and everyone in the vicinity rushed in to see if my brains were oozing out. Thanks to the fact that my head is solid ivory above the neck – as anyone who knows me would readily testify – nothing much had happened barring a Donald Duck style protrusion from my right forehead and a severe headache. 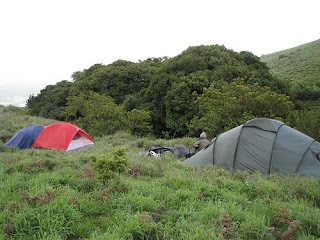 You really have to do this sort of trekking and have food cooked on an open camp-fire before you can understand how delicious food can taste even if it does not match up to gourmet standards. That one can enjoy balancing paper plates heaped with rice and sambar while standing on rocks with a waterfall sleeting down in the background can prove to be difficult to believe otherwise. 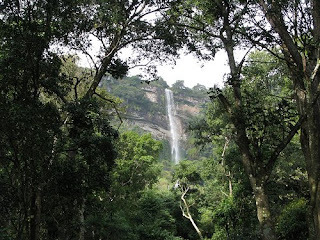 The rest of the trek was a repeat of the slippery slithery approach to the waterfall till we reached open grassland from whence the trip to the campsite was a proverbial cake-walk. The campsite itself bordered a gurgling stream and since it was but noon by the time we reached it there was lots of time to keep the kids occupied with dumb charades and other such parlor games. But what a parlor to play games in! Rains had kept off thus far though it was rainy weather. This combination of cloudy and breezy weather without rains was ideal for trekking and we had luck all through the two days with the weather holding its pattern except to bless us with a delicious drizzle every now and then. Add to that the fact that the mist converted the view into an enchanting fairyland that shafts of sunlight caused to glow like a huge gem. 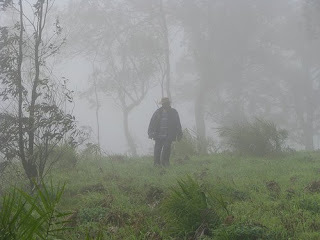 The next day’s trek was down to Kemmangundi and we were walking in this fairyland through the mists. It was like walking through clouds and – who knows – maybe they were the clouds as seen from below. 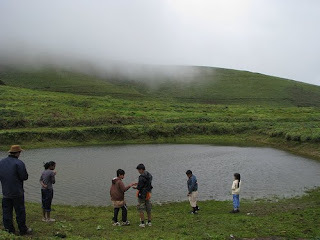 One of the problems with trekking is that you climb down to hill stations like Kemmangundi instead of traveling up. 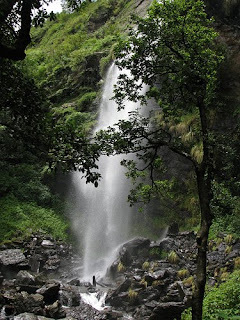 This, then, ensures that you feel let down by the hill station for it cannot match up with the views that you have already seen. We took a little diversion to go to the ruins of a British fort and it was a thrill to see tiles made in the 19th century lying around. Thereafter we trekked down to Kemmangundi in relative ease till we reached a steep and slushy slope that had to be negotiated. With my customary grace and elegance I sat down on the path and traveled down on all fours in order to avoid a speedier descent than may have proved comfortable to me as well as those traveling before me. The last stretch was too difficult and, so, the organizers strung up a rope so that one could hold on to it and descend in relative comfort. Having so descended we reached civilization. A short walk took us to a local resort where we had our lunch and went in for some rappelling. Descending down vertical cliffs while secured to a rope harness is one of those things that I never thought that I would ever do, leave alone enjoy, but it so happens that I do find it enjoyable. Any trek feels anticlimactic when it ends. Like most things that we do for the joy of doing, it left one feeling that the experience had ended too soon. Well! There is always the next one!